I've started this bag twice and I'm about to frog it yet again - for the same reason. It's the size of a friggin' suitcase! I was planning to felt it but still, this thing will be huge - and take forever to finish. I took Lois's advice (note: when in doubt, listen to your LYS* owner. Just like mom, they do know best.) 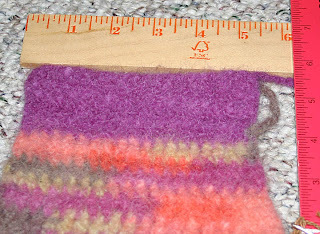 and crocheted a sample to felt. 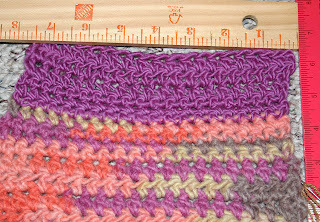 I measured before and after, then calculated the rate of shrinkage for both yarns. Now I'm going to come up with my own pattern to meet the dimensions I want in a project bag. It'll give me something to do when we take Addy to Disneyland for the first time Monday and Tuesday. Want to bet not much crocheting gets done?